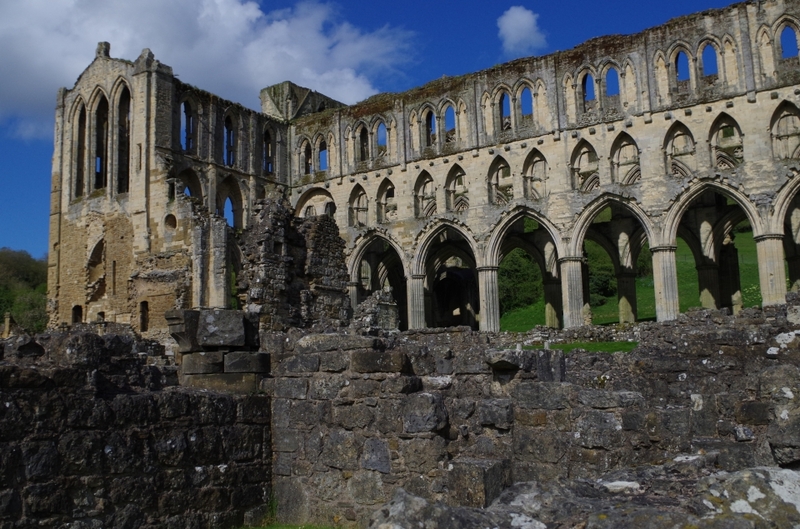 On my last visit to Yorkshire I promised myself a trip out to Rievaulx. I have been there before, but I don't recall actually going round the Abbey itself, so decided this was something I should do. As it happens, my friend received information on a wildflower walk which was taking place during this week, so booked us on to that. 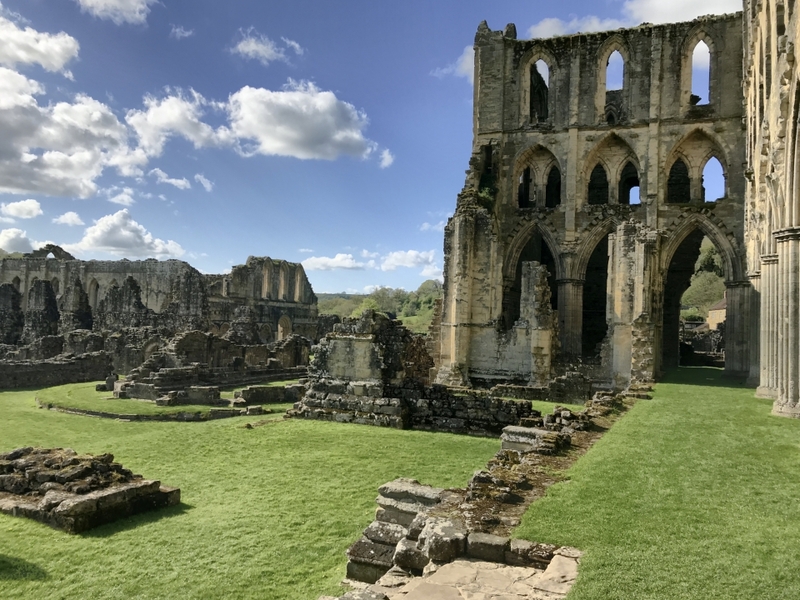 We headed off to Rievaulx Terrace, which is a National Trust property (both members, so free entry) and had a look round before the walk started. 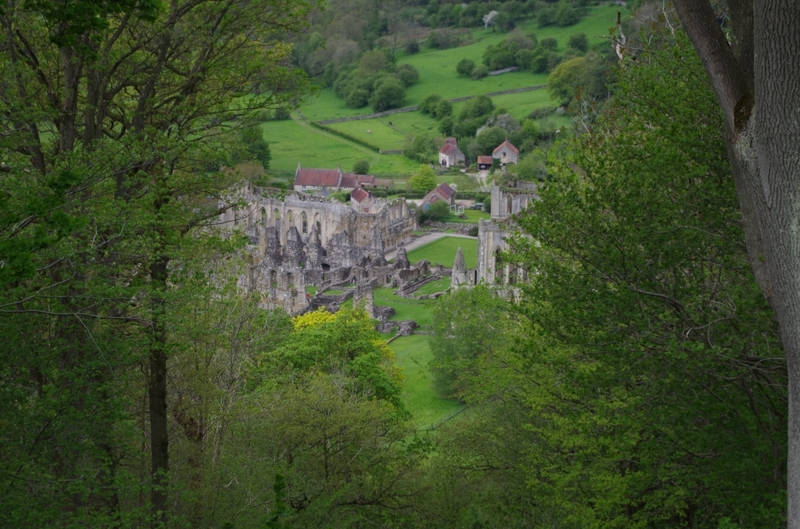 Along the terrace there are around 12 viewpoints, where a gap has been created in the trees to provide a view across the valley and down onto Rievaulx Abbey. We joined the walk at 1.30pm and it took around 90 minutes. We were taken down a central path through the woodland, not the usual tourist path. 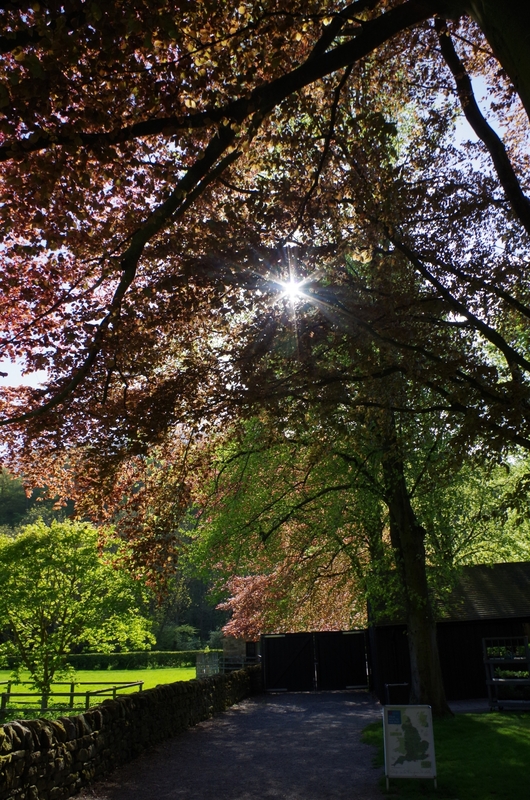 As a result we were sandwiched between modern planting and woodland planting created when the terrace was developed, in the 18th century. The chaps running the walk were very interesting, pointing out a variety of wildflowers. Among the ones we saw were ramsons, English bluebells, Helleborus viridis, a rather rare, green hellebore, an early-flowering orchid, forget-me-nots, the delightful adoxa moschatellina (town hall clock flower), cowslips, primroses and many more. 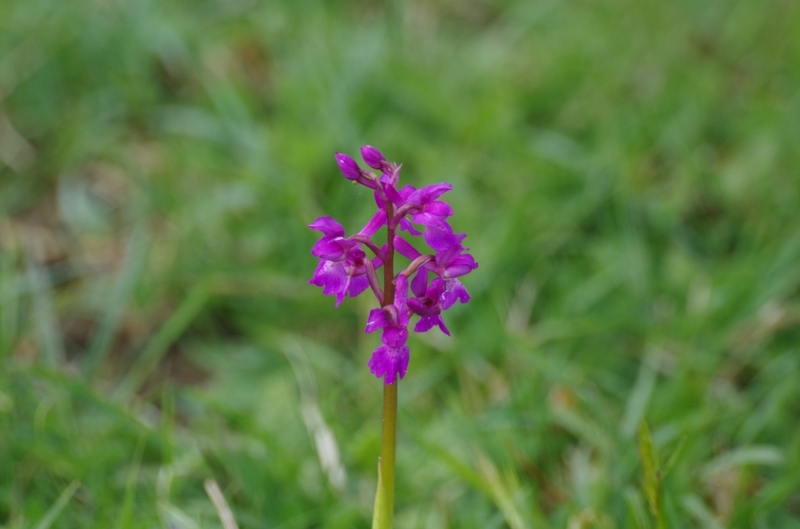 Orchis mascula - early purple orchid. 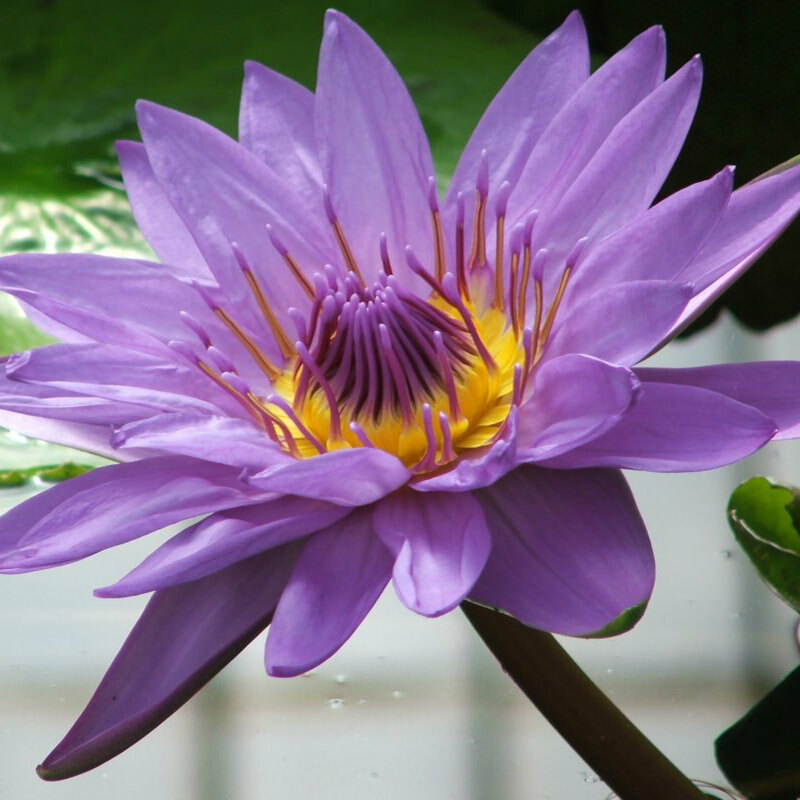 What was particularly interesting was the discussion around native planting and using non-native plants to restore the gardens, because they were plants either used in the 18th century, or by the Victorians at a later date. 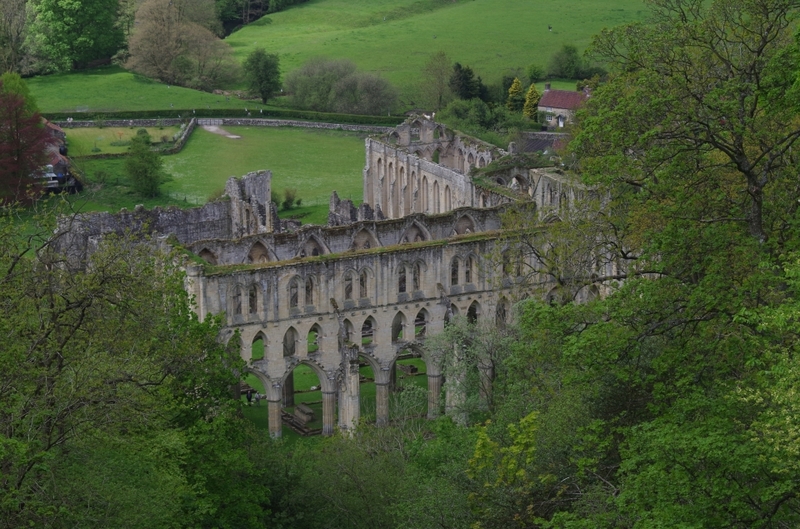 We learnt about various conservation techniques and decisions that were being made regarding viewpoints over the valley - not least the fact that they don't believe the trees were originally there; that the terrace was probably originally designed as a kind of infinity terrace, sloping away out of sight to provide uninterrupted views of Rievaulx. It was also likely designed not as a promenade, but to be seen from a carriage. Unfortunately, the trees have to stay, as they cannot now be removed. 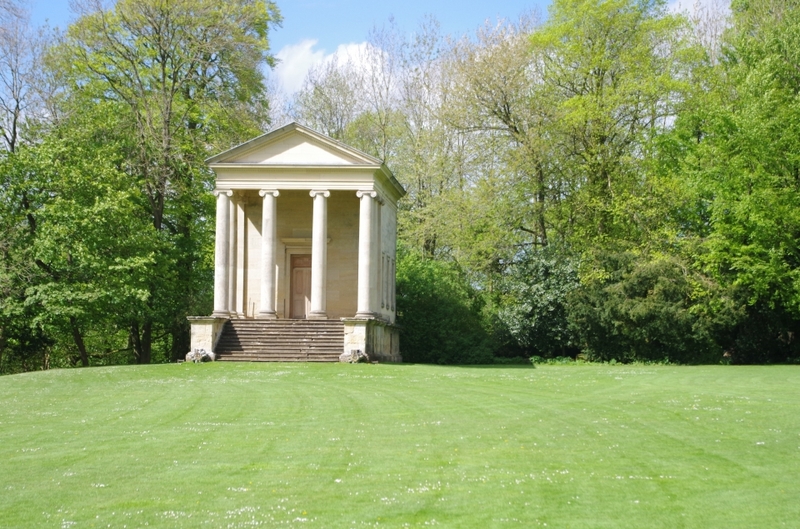 At either end of the terrace is a temple: one Ionic, which is open at times, the other Doric, which is closed. 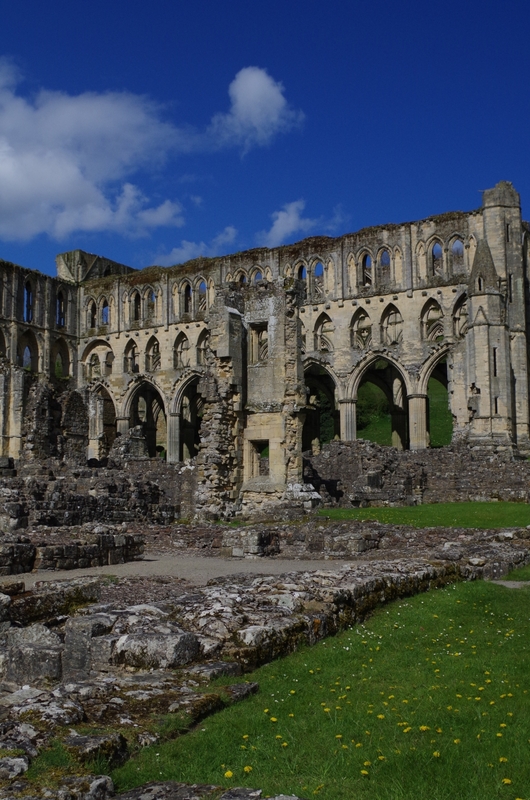 We later learned that some of the decorative tiling from the Abbey had been used on the floor of the Doric temple. 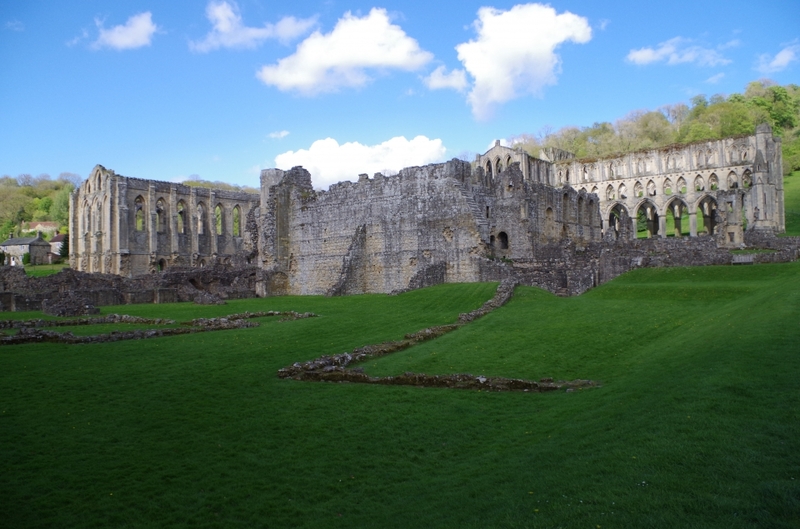 After the walk finished, we decided to head down to Rievaulx Abbey itself. 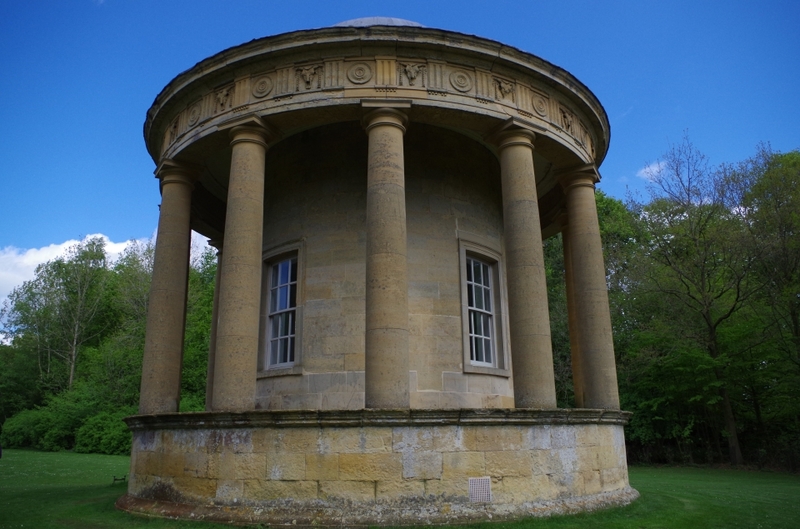 This is owned by English Heritage, but I am a member, so free entry there as well. After a stop for some tea and cake we headed off to walk round the Abbey ruins. The weather was superb, almost too bright, as it made photography tricky, trying to expose the stonework correctly without bleaching out the sky. My camera has built-in HDR, but it's not fantastic. My iPhone, however, made pretty good work of applying HDR to the scenery, so my best photos are a mix of phone and DSLR. In this photo you can clearly see the older, 12th century stonework in the foreground contrasting with the later 13th century stonework of the presbytery in the background. 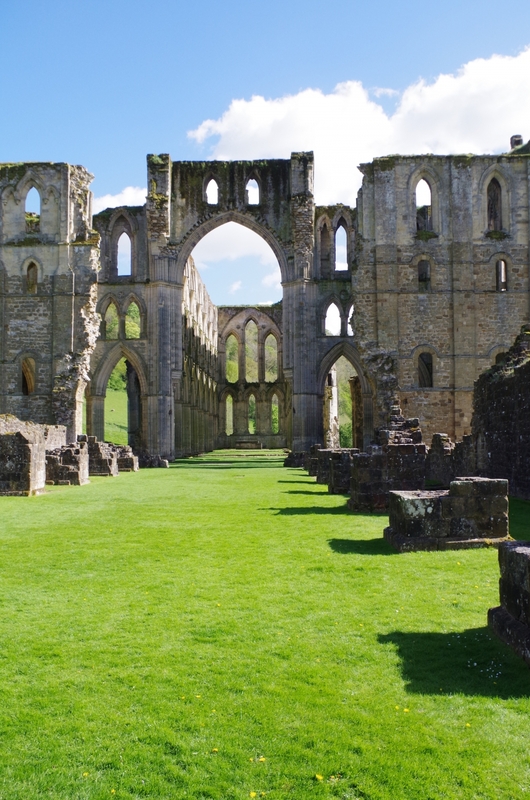 The Abbey was both added to and reduced over time, as lay brothers left the monastery, leaving only the Cistercian monks in residence. 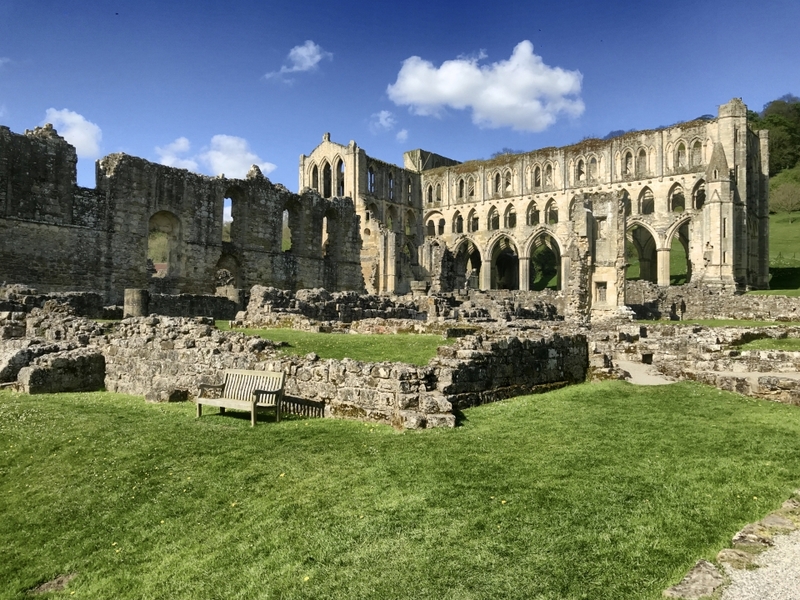 It was sacked by the Scots in the 1320s and, of course, Henry VIII later put an end to a vast number of churches and monasteries in England, of which Rievaulx was one. However, the ruins here are extensive and quite, quite beautiful. I'll leave you with a shot of some of the beautiful foliage on the path away from the Abbey.